Yesterday was kind of a big day for me. It wasn’t anyone’s birthday or anniversary or anything like that. I didn’t go anywhere or get anything super awesome. It was just a very nice, sunny, calm, clear day, and as anyone with a decent amount of baking experience will tell you, that is prime macaron weather! Yeah, I did the whole run-upstairs-and-squeal-incomprehensibly-about-feet thing after taking them out of the oven. Since almost no one within, oh, a 50 mile radius of where I live has even HEARD of macarons (sooo tired of explaining that they’re not blobs of coconut!) I clearly had to make my own if I ever wanted to try them. Well, I guess I could have just waited until next month when I go to New York (and I still fully intend to spend some serious time at Tafu, guzzling tea and gorging on Mitzy’s macarons), but I’m impatient. And have you heard? I like a challenge. Oh swirly top...you should not be! 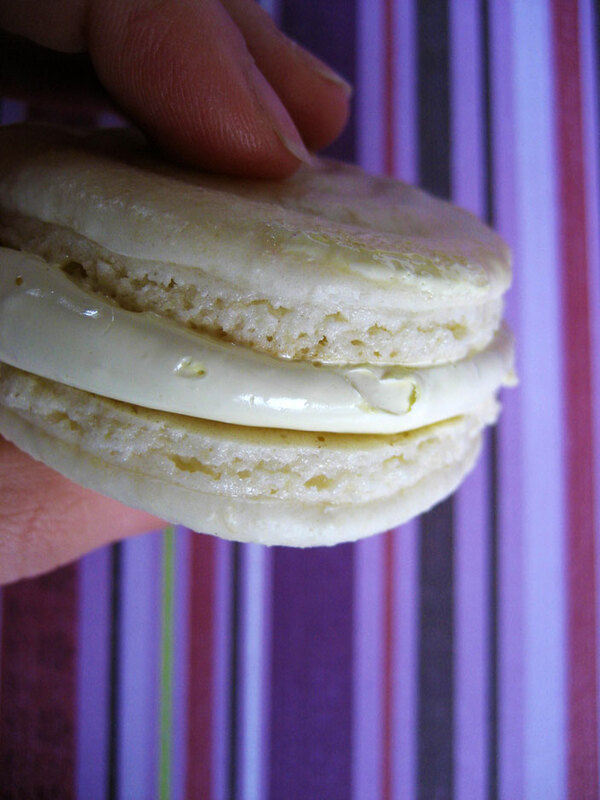 My macarons are, like many first attempts, not perfect, but good enough to be considered a success. I mean, they have FEET and everything! And a nice crispy shell with chewy insides! And they’re even BETTER tonight than they were last night! You can clearly see that they didn’t really flatten out like they should have, though. I’m thinking my meringue was whipped a bit too stiff, or maybe I just didn’t fold everything together quite enough (I was concerned about over-mixing and deflating the egg whites). And I now understand why many recipes call for you to flatten the tops out a bit with your finger after piping – the little peaks in the middle cause them to be a little fidgety on the plate. They won’t sit still with their little un-flat bottoms! Since I didn’t know (ok, didn’t think) that these were going to work on my first try, I decided not to play around with fancy flavors for the shells. I figured if I didn’t add any flavoring beyond some vanilla sugar, the almond would be more perceptible. And what goes with both vanilla AND almonds? Honey!! Well, to my tastebuds it does. 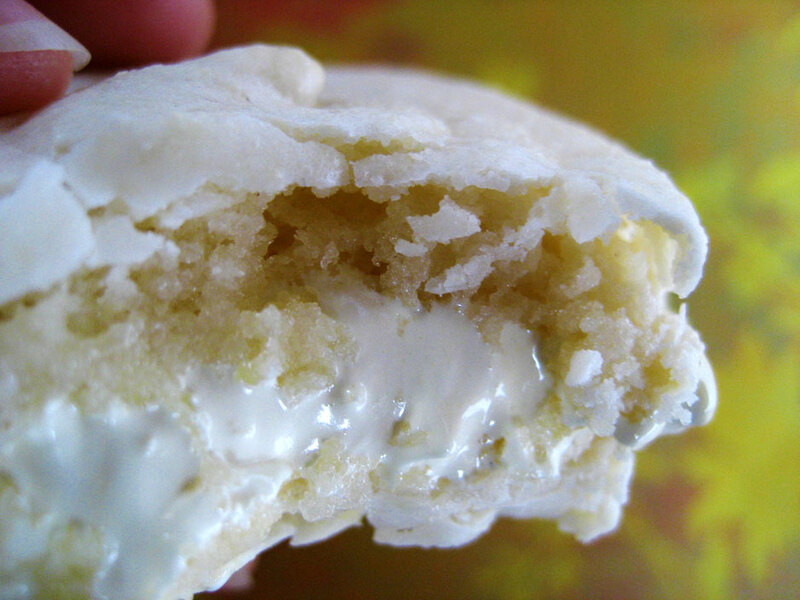 Gooey, sticky filling. Like honey-flavored marshmallow fluff. I had been meaning to revisit the fluffy honey frosting that I made a few months back, and thought this was the perfect excuse to whip some up! It works perfectly with the slightly nutty shells, though it’s so sticky that I have to pry the macarons apart if they sit too close together on the plate. 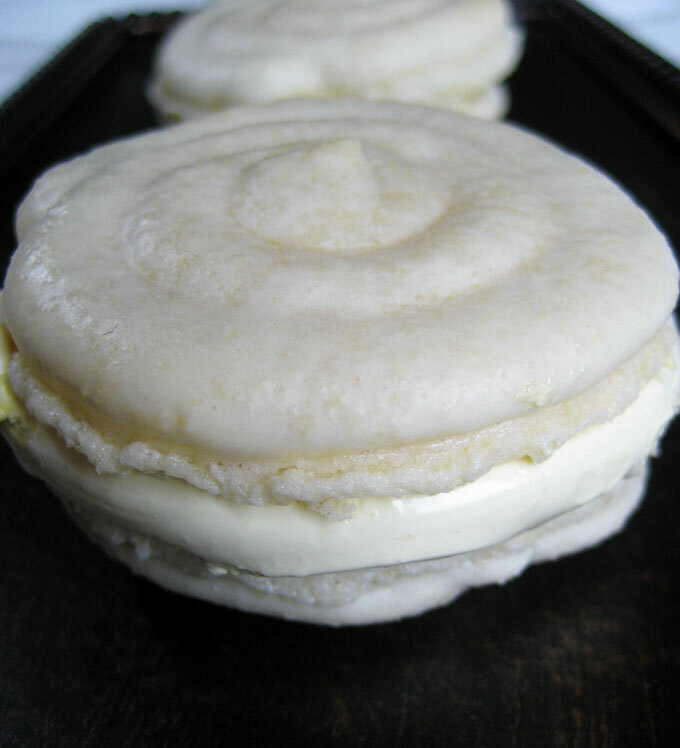 It is super sweet and, texturally, makes an awesome macaron filling – the slightly crisp shells give way to chewy insides which in turn give way to a gooey honey treat in the middle. Not so fancy NOW, are you, macaron? 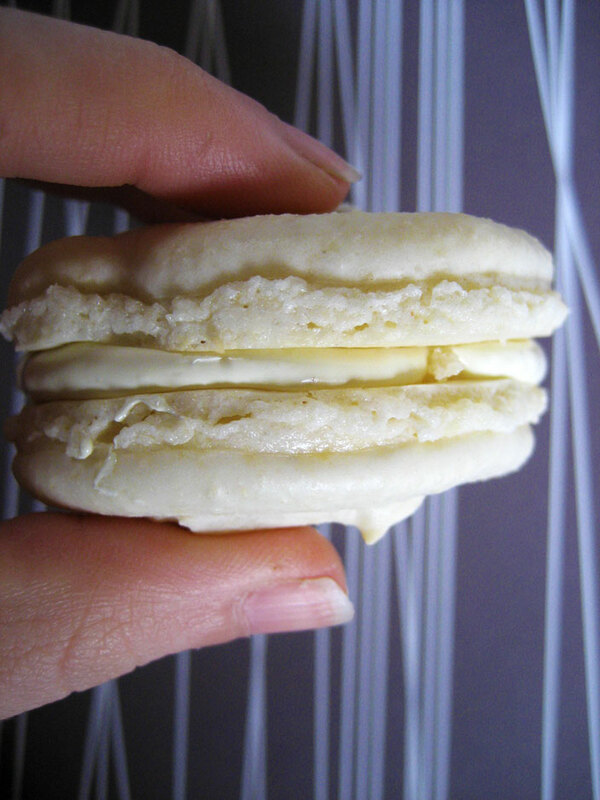 My only other complaint about these particular macarons, besides the lackluster color (and I even added some yellow gel coloring to the honey meringue – really!) would be that they are bigger than I’d like. I traced out circles with the top end of a shot glass. Next time I’ll trace the bottom, which is probably about half the size. Once I get good at these I want to make really itty bitty ones. Just because I’m small. And I like small things. Also, when things are small, you get to make (and eat!) more of them! Hooray! I’m no fool when it comes to recipe planning and based this recipe off of a guide by the Queen of Macarons herself, Helen of Tartelette. The only thing I really changed (other than doing the conversions to clunky American measurements) was substituting vanilla sugar for the regular granulated sugar, which I ground with mortar & pestle until it was super fine. Once again, I recommend using a food processor if you have it, because you will be grinding for at least 10 minutes if you do it by hand. It almost looks perfect from this angle, except for that little peak hanging onto the bottom. First, prepare a baking sheet with a piece of parchment paper or a Silpat. If you are new to making macarons, you should use the parchment and trace circles (about 1.5″) on the back with a pencil so you have a size guide when piping the batter. Sift together the powdered sugar and almond meal. Whip the whites to a foam and gradually add the vanilla sugar to obtain a glossy meringue. Fold together the mixtures, working quickly at first and gradually slowing down as you go. You shouldn’t have to use more than about 50 strokes. Test a small amount of the batter by plopping it onto a flat surface. If the top of the batter flattens out on its own, it’s all set. If not, fold it a couple more times. Transfer the batter to a pastry bag fitted with a large plain tip and pipe into circles. If you’re using parchment, it’s a good idea to use a tiny bit of batter in each corner to stick the paper to the baking sheet, so it lays flat. Once the macarons are piped, allow them to sit for an hour so a skin can develop. Meanwhile, preheat the oven to 300. Once the hour has passed and the oven is sufficiently heated, place the baking sheet in the oven and bake for 10-13 minutes (mine only needed about 10 – any more and I think they would have been too dry inside). Allow to cool fully on the baking sheet. If you have a hard time removing them from the parchment, drizzle a few drops of water underneath the paper, and use something like a knife or metal spatula to help remove them – if you try to just tug them off they’ll fall apart. Pour honey into a small saucepan and bring to a boil over low heat. Meanwhile, whip the whites and salt to stiff but not dry peaks. Reduce speed to medium and add the honey in one continuous stream. Drop in the food coloring and return to a high speed until the meringue attains stiff peaks. Spread between fully cooled macarons (I was going to try piping with a plastic bag but it was too sticky). Z says these taste like baklava. I don’t really agree, but I get what he means – the honey flavor is strong and the nuttiness is subtle but definitely there. I’m just glad that I can get my almond and honey fix without having to (rather guiltily) outright dip raw almonds in honey. To make these even more over-the-top, I might add a bit of fig to the center of each. I’ll have to try that once they’re in season. Congrats on your first macarons!!! I’m still hesitating … haven’t yet worked up the guts to give them a shot. But I will I will – someday. Yours look great … especially that bitten-off shot .. yummmmm. I, like Muneeba, have not yet mustered the courage to make macarons (I have a bit of an egg white phobia left over from a culinary school disaster) – but yours look amazing. And your description makes it sound easy. I think I need to try! Lovely job–first attempt notwithstanding! The way I keep them from having ridges is to pipe in one place, holding the back perpendicular to the parchment, squeezing until I like the size, and then stopping and pulling up and away. A wet finger smooths out any little “bump” in the center. My gosh! They look so good that I can almost taste it! Great job! Great job! Those turned out MUCH better than my first try! 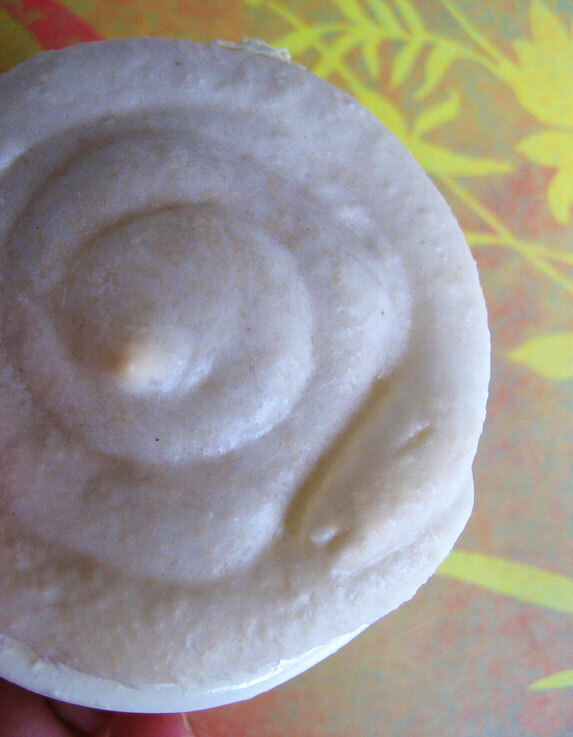 I like the little swirls on them….maybe not professional, but cute nonetheless. Congrats! Thats awesome. I have been wanting to try to make these for some time, but never do, because quite frankly I am a bit intimidated. You have done a fab job! Congratulations on getting your feet! They look wonderful and what a gorgeous flavour you made. Bravo! You made it, well done. I love the filling you came up with!